Alfred Noyes' poem came to mind this evening as we walked, shortly after dinner, under the moonlight. The lights of the house offer a warm contrast to the chilly looking moon. 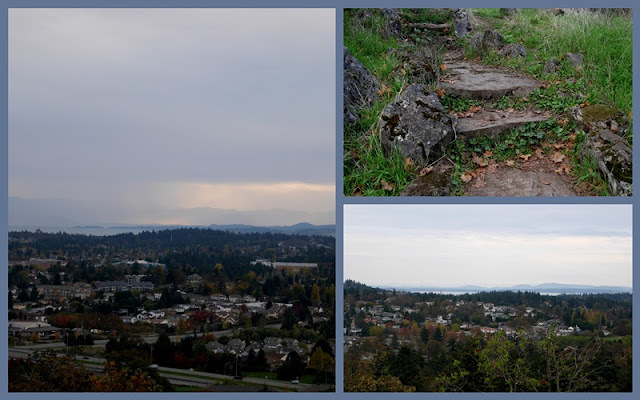 After arriving home, I took my camera and walked a little ways down our street to capture these views. It's a Hunter's Moon - a traditional name given for a full moon in October. Or maybe that's tomorrow night. It might be raining then, so I'm glad I took the photos this evening. I've been thinking today about the whale watching tragedy that occurred not too far from us, where a boat capsized and 5 British nationals perished in the cold water. Twenty-one were rescued by locals who saw the emergency flares. One is still missing. My heart goes out to the families of those who lost their lives. And the moon sails overhead, oblivious to what happens here on earth, its beauty and light seen by people the globe over. What a world we live in, broken and hurting, yet full of wonder and love, too. Dull skies. Cozy fire. It was hard to pull ourselves away and go for a walk this afternoon, but walk we did. We got to the point along our route where we either went up and over Christmas Hill or turned back towards home. Eyes met. We sighed and began trudging up the stone stairs. The view at the top rewarded us. At least a 180 degree view of water, mountains and clouds. This poor little hydrangea blossom doesn't realize it's October, not June. Likewise the new magnolia tree we planted in the spring. I thought we purchased a spring-blooming variety, but perhaps it's the fall one. We'll see what happens in April. The strawberry plants are just plain crazy. Will the warm weather hang on enough to harvest these berries? We did pick a big bowl of raspberries yesterday. It really is autumn. Leaves whirl off the trees and scuttle along the street turning cartwheels. Diligent homeowners rake up huge piles for collection. I was tempted to dig in and throw them into the air. But I resisted. I'll be linking with Mosaic Monday, hosted by Judith. Yesterday afternoon I stepped out onto the porch for just a few minutes to capture the light on these forsythia leaves. Their autumn color definitely harkens back (or ahead) to the yellow blossoms of early spring. My weekend activities were waylaid by the above. It arrived last week and I resisted for a couple of days, but then gave in to "just starting." Well, we all know how THAT goes. Housework and sewing went out the window until the book was finished. I did finish it before returning to school on Monday or I don't know what I would have done. Quite frequently I catch a student with a book on his or her lap while I am giving the class instruction. I tell them to close the book and pay attention in a no-nonsense tone. I'm inwardly sympathetic, for I was one of those students, trying to secretly read while the teacher nattered on and on. And I was often caught, too. Now that the book is finished, I am concentrating on the sewing. Thanks for asking how it's going. Tim was away at a conference last night, so I stayed up waaaaay too late and just have to insert the sleeve linings and hem the lining. That's tonight's work. Hopefully. It's turning out well. Arriving home from school, I made a cup of tea and lit a pumpkin scented candle. The magazine was purchased when I bought groceries earlier this week, but it's not yet been opened. That's a delight to anticipate. I'm not entirely undisciplined! I just swallowed the last bit of tea - rather cold now, and it's time to think about dinner. Chicken breasts with sauteed mushrooms with peas in a light sauce, some coucous or quinoa, a simple salad. Were you ever caught reading while the teacher was talking? Sunday afternoon. Time for a good long walk. This trail will take us around Thetis Lakes, both Upper and Lower. He's in a short-sleeved t-shirt, me in a long-sleeved one. The weather is fine, with dull skies through which the sun breaks in welcome bits of brilliance. When I look at maps of Canada, I'm struck by the generous sprinkling of lakes. Fresh water is a precious resource that we must protect. On Thetis Lake, no motors are allowed. Here a canoe glides behind the screen of trees along the trail. The leaves are falling fast. In just a few more weeks the branches will be bare. A curled leaf on a fallen tree, both slowly returning to earth. Textures galore. Colors superimpose in layers, always against the evergreens that dominate the landscape. Our hiking loop has taken about an hour and a half, including a little time for photo stops. Home again to the welcoming scent of roast beef in the slow cooker. A cup of tea and some blog reading before I make dinner. 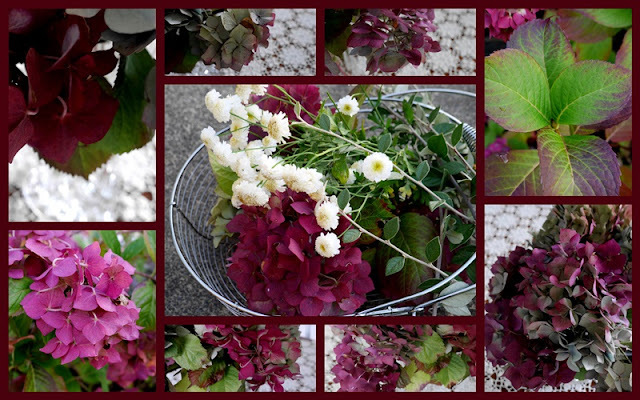 Linking with Mosaic Monday hosted by Judith of Lavender Cottage Gardening. On a Friday afternoon, I exit the school building and blink at the bright sunshine. Tasks of teaching fully absorb every thought during the day and I am almost disoriented now. As I drive home, my mind turns to other things, like the walk we took last Monday to the top of Christmas Hill. The city spreads before us, a medley of nature and human effort, with the Strait and Washington's Olympic Peninsula beyond. A gnarly Garry Oak stretches moss-covered branches over the path, almost as if reaching to touch passersby. Once again I am reminded at how prodigious is life on this planet. Left to itself, nature soon takes over cleared fields and homesteads with blackberry brambles, thistles and broom. Life is prodigious, but I cannot pick and choose what will have life and what will not. I plant seeds and the miracle of growth occurs, or it does not. I can only wait and see, water and weed and hope for the best. "How odd," I think, "to be pondering planting and seeds when autumn is upon me." Perhaps, yet I'll be planting bulbs in the hope of spring blooms, and these pretty red leaves will become compost and nurture the soil. I stop at the grocery store on my way home and buy a ready-to-bake pizza. Friday evenings are slow around here - dinner on a tray in front of the television. A BBC mystery, perhaps Miss Fisher, or Death in Paradise. It's lovely to think of sleeping past 6:30 am. A weekend project besides the laundry and cleaning. A moto-style jacket. The fabric I'm using is behind the pattern. Wish me luck! Stephanie of The Enchanting Rose hosts a teacup (or mug) exchange twice a year. I've read about it but never got my act together enough to participate. This year I said I would. Several weeks ago I received a lovely parcel in the mail. Tearing off the mailing wrapper, I discovered a French-themed gift box with an Eiffel Tower. Loved it! Inside the box was an elegant tea cup, a hand knit dishcloth, teabags, a package of silvery napkins to match the cup, a trio of Ferrero Rocher chocolates (yum), and a note from Sandra of Ravenhill Cottage. Here's a close up of the teacup. Isn't it pretty? I'm looking forward to trying the Blackberry and Elderflower tea. I've not done so yet, because tomorrow is the big link up at Stephanie's blog for all the participants to show their tea items. My parcel was sent to England and I didn't take a photo of it before mailing it. I don't think it's arrived quite yet. A big thank you to Sandra for the parcel, and another big thank you to Stephanie for organizing the exchange. While chocolate and tea make a perfect pairing, sometimes a savory treat goes equally well with tea. This past weekend (Thanksgiving), I tried out a new recipe for an Apple Cheddar Tart appetizer. It was different, and quite yummy, although my husband said the apple was unexpected. Guess I'll have to warn him next time! 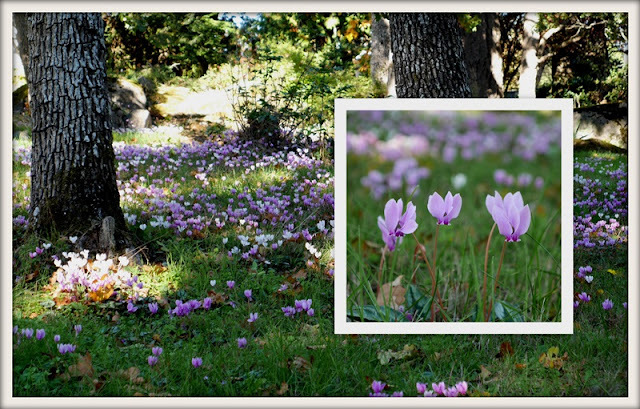 Summer's soft blue blossoms have silently turned to rich shades of purplish wines and pinks more suited to autumn. There wasn't a lot of quiet yesterday as 11 of us, 8 adults and 3 little ones gathered for Thanksgiving dinner. The littles sat at a table just their size and later watched a movie and played while the adults ate. The house is quiet today. We took my parents to the ferry this morning and stopped at Elk Lake on the way home. We hoped for a walk, but the pounding rain deterred us. Leaves fall on the water to dance slowly in rhythm with the waves. The rain slowed to a misty drizzle when we got home so we did a little garden clean up. Then inside for turkey dinner leftovers (yay!) and a slow afternoon full of thankfulness for many, many blessings from the Giver of good things. Life may not be without care, but there is always something for which thanks can be given. Late afternoon light shows off the sculptural petals of this dahlia just before I clipped it for the house. Blueberry leaves are fire engine red and will soon begin to tumble to the ground. A storm blew in this afternoon and rain pelts the garden. This pumpkin, photographed yesterday, is the brightest spot in my garden. Indoors, we're warm and toasty. The pumpkin pies are cooling. My parents arrived this afternoon and the recipe pictured above was sitting on the counter. Mom was surprised to see it there, well used and spattered. It's the recipe from her own childhood, one that her mother used. Bread slices dry in the laundry room (on the counter, not in the dryer!). The turkey is thawing. Potatoes and sweet potatoes, pickles and onions are bursting the cupboards. Tomorrow we gather in thankfulness. Last weekend's weather felt like a summer's day. Hot sunshine. Warm breezes. On my Sunday afternoon walk I picked up a few autumn leaves and brought them home to reside on the hall table. I pulled out the October quote by Anne of Green Gables, created by a friend for my birthday last year. And on the chalkboard I wrote, "Welcome Fall." Neighbourhood sights include this home with window boxes filled with red geraniums. I admire them each time I pass by. Soon this old car will be tucked away, sheltered from the wind and rain. Autumn seems to have taken my welcome sign at face value for today there's a change in the air. Less warmth. The sun not quite so bright and a bite in the air. After school today I kicked my shoes off, made a cup of tea and sat down. 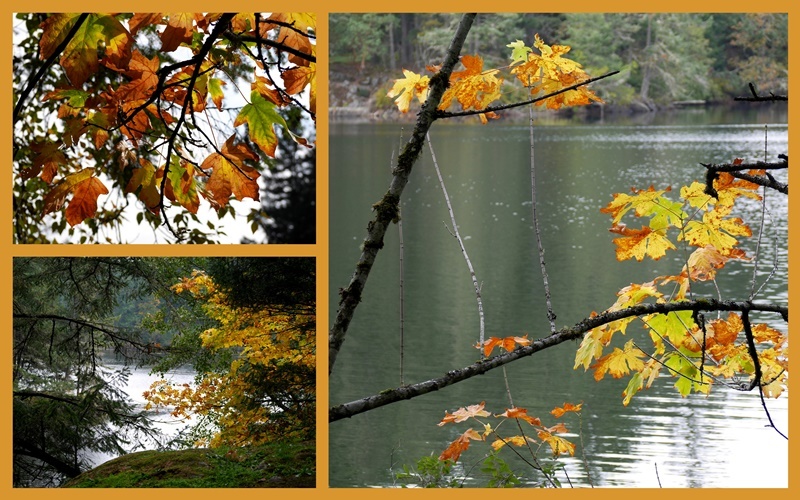 I could have marked papers, but instead I played with Image Chef, making a mosaic including things I love about autumn. It could be an educational tool according to the website, so I don't feel bad at all. 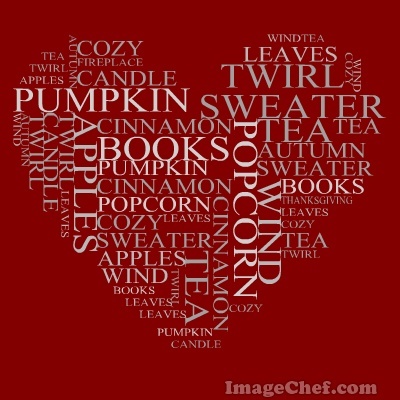 What do you love about autumn? Is there a change in the air out your way? These early October days hang, suspended between full summer and dark November. The blue bowl of the sky seems rounder, its shape accentuated by sharp silhouettes of trees and hills. As the days slip by and we go about our daily tasks - home, work, school, church, community - each of us absorbed with life. But for some these days hang, suspended between hope and despair. A young couple loses their first baby just days after birth. They go home from the hospital with empty, aching hearts. In tears I pray for comfort. Friends wait for appointments, slow to come, to determine the cause of worrisome symptoms. Frustration mingles with fear of the unknown. I pray for peace and action. Rose hips hang now against the blue sky where scented wild roses once arched. To everything a season. Others I know embark upon waiting, too. Days are filled with the ordinary tasks, but behind each one lies questions. I pray for grace. And still the sun shines, the leaves delight with their colors, and the marvelous beauty of this paradoxical world fills us with wonder and gratitude. Another October rolls round. My birthday month, but not until the end. Days of cooling nights and still sunny days. Pumpkins and apples. Pears and warming soups. Thanksgiving. Golden rushes that will soon burst those fat tails. Photo taken in Alberta - ours here have long flung their seeds to the four corners on the wind. Last Friday 45 of us (40 students + 5 chaperons) boarded a big yellow school bus. Over the water we went to Vancouver, to see Bard on the Beach - a yearly venue for Shakespeare productions. The Comedy of Errors was playing, with a steampunk theme. Delightful! We all laughed at the antics and wit of the actors. I especially enjoyed the costumes and set changes. Home again, over the water as the sun drifts lower toward the horizon. Misty islands. Sculptured clouds. Over the weekend I tried out a new recipe from another blogger. Penny of The Comforts of Home posted this a few weeks ago. Slow Cooker Chicken Chile. Delicious! This hearty dish will become a regular around here. The only changes I made was to use one can of beans in place of two. The slow cooker has become a dear friend as I've transitioned back to work. It's a wonderful thing to walk across the parking lot after classes and know that dinner is mostly prepared. And so begins October. How's it looking around your place?